We want to provide you with an update on the current status of the Solar*Rewards program. The Colorado Public Utilities Commission (PUC) issued a written order on the 2012 RES Compliance Plan on June 8, 2012. As a result, the 2011 Solar*Rewards Settlement period ended and we stopped accepting applications under the terms of that agreement. 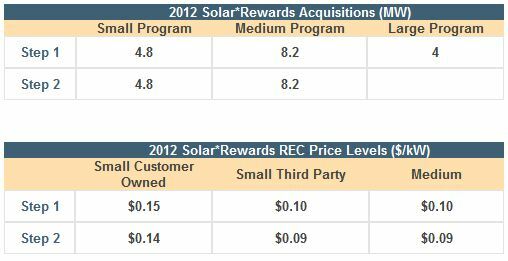 The new Solar*Rewards programs, as designed in the 2012 RES Compliance Plan, will open Wednesday, June 20, 2012 at 8:00 a.m. MST. Thank you for your continued patience as we work quickly to modify internal business systems to accept applications for the new programs. This also allows time for application deposits to be remitted and applications to be reviewed that were received by the June 8, 2012 program close date under the Settlement period. The charts below show the available capacity and REC price levels, by program, for 2012. Once the programs launch, we will begin accepting applications under the first step of each program. We will continue to update our website daily with reviewed and available capacity. The deposit level for the Small programs will remain at $250 per application. Please note that all Medium program applications will require a deposit of $1,500. The Solar*Rewards Community program is expected to launch at the end of July, pending a final order from the Colorado PUC. The program will open with 4.5 MW available in the standard offer program (10 kW — 500 kW) and 4.5 MW available in the RFP program (500.1 kW — 2 MW). These amounts include moving half of the capacity from 2011 into 2012. The remainder of the 2011 capacity will be rolled into the 2013 offering. We will provide you with more details, as well as a program launch date, as information becomes available. We look forward to the program launch and continuing to work together to build the solar community in Colorado. Please direct questions to solarprogram@xcelenergy.com.